I recently read some blogs conveying negative feelings on self-help or self-development. Many said they were fully capable of helping themselves thank-you-very-much then stating a majority of people who read self-help materials never put anything into action. I find this quite interesting because I grew up learning the contrary. It’s been said leaders are readers. The most successful people today are avid readers, many in the personal growth categories. They’re reading materials and following others who have fantastic results in spirituality, finances, relationships, health and leadership. They absorb what information is relevant to their life and act according to their passion and purpose. There was, however, a bit of truth in the anti-self development writers and that’s the characteristic of no action. Are you that person? Are you soaking up personal development material and still unwilling to step outside that comfort zone? If you’ve read my posts or other personal growth material, how’s that going for you? Have you put it into action? Or, are you just thinking about it while you read more books, satisfied with the status quo? A step towards personal growth starts by getting outside your comfort zone. Acting on what you comprehend is key to personal growth. You can read the most excellent quotes, insightful books and witty blogs on earth, but without action on your understanding, you just have a lot of consumed knowledge. Successful, joyful people are known for keeping their mind open to trying new things and then doing them. They take risks, believe in their dreams and aren’t afraid to act on what they’ve learned. I was guilty of this practice years ago. I was so excited about improving my life, that I’d read an excellent book, take notes on it, then neatly tuck them away on my night stand. There! That feels better! I read a book, even wrote some notes; put a check in the box. I noticed a few changes, but nothing significant. It wasn’t until I allowed myself to let go and actually act on this knowledge, did I see amazing results. I wasn’t as caught up in being constantly perfect. More business fell into my lap. People were thanking me for my coaching and insight. My insight? All I did was read a book or ten, stray outside my comfort zone and act on knowledge. I did something anyone could do. So it’s time for a checkup. 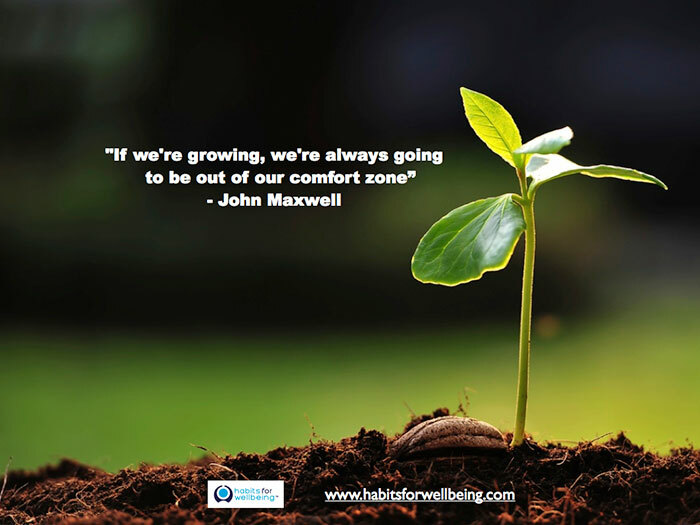 Have you strayed outside that comfort zone yet? Have you acted on some fantastic knowledge lately, or are you just complacent? Are you noticing the difference you envision? If not, it’s time to act. Today. So very true. I love that you took it a step further – that you not only have to read these books but you have to apply it, make a mental effort to practice it – only then will change come. I sometimes struggle with that part so thank you Kristie! When we read something only a certain amount is retained. Plus, it is retained in that frame of mind ( when you read the book). As life happens, the mind changes it perspective on many things, thus to reread a book is to gain new knowledge every time. To read inspiring books and push out of your comfort zone grows lifes experiences and new perspectives. Then to reread anyone of those books compounds what is learned.